To Lisa and Staff, Thank you so much for your love, kindness, and choosing a wonderful loving and caring staff. You guys have helped me walk on my own again, climb my 3 flights of stairs by myself and even almost run! Love, Pat C.
Dr. Meghan Goetz, PT, DPT, is a NY state licensed Physical Therapist. 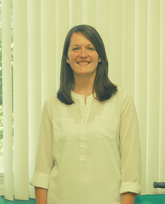 Meghan has a diverse background of clinical experience in acute care and rehab settings. Meghan is a full time therapist at Mercy Medical Center, working closely with a wide range of patients with various diagnoses including stroke, spinal stenosis, joint replacement, amputation, and congestive heart failure. Meghan joined Physical Therapy Options as a part time therapist in June 2014 after graduating physical therapyl school. Doctorate in Physical Therapy from Long Island University Brooklyn in May 2014, Bachelor of Science degree in Biology from LeMoyne College, Member of the American Physical Therapy Association since 2011. She has taken several continuing education courses including management of orthopedic conditions and Proprioceptive Neuromuscular Facilitation. Meghan believes in providing patient centered care with personalized treatment plans to improve each individual's function. She believes strongly in treating every patient with compassion and respect while maintaining a positive and encouraging environment. In addition, Meghan believes in life long learning to further her development into a well rounded therapist and person.